If you are needing a portable Peak Style Portable Garage-then this Shelter Logic Canopy is the perfect choice. 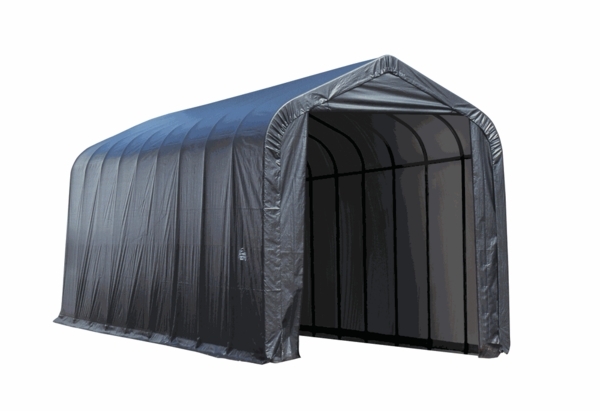 This garage canopy measures 16 ft. x 36 ft. x 16 ft., and is made of a single piece of 9 oz., heat bonded, triple layered polyethylene that is treated to be anti-fungal and anti-aging, as well as being fade resistant and 100 percent waterproof. This sturdy portable garage is constructed of high-grade steel that goes through a 13 step Rhino Shield surface preparation process and can withstand all but the most rigorous weather conditions. This structure sets up quickly, and comes with a 1 year warranty. Is this fire resistant? Is it snow rated? This item is not fire rated and does not have an snow load rating and the manufacturer recommends you keep the snow of of the roof with a soft broom. Unfortunately these units, while incredibly sturdy, are not wind rated. This item has a listed weight of 1311 pounds. What is the height of the drive thru opening? The height of the door on this item is 160 inches. Are both ends of this ShelterLogic peak style garage canopy open? This shelter is only open on one side. How much does the tarp material for this canopy weigh? This is made of a single piece of 9 oz., heat bonded, triple layered polyethylene that is treated to be anti-fungal and anti-aging, as well as being fade resistant and 100 percent waterproof. How long will the fabric last? Does the front door close? The life of the fabric will vary depending on the conditions in your area and on the care and maintenance you give the cover. And yes, the front door closes. 16x36x16 was actually 14 wide but that fit my area better. Instructions that came with were for a 12x10 which was no help at all..the part #"s didn"t work. A.download of.the 14x36 fixed that. Fed ex delivery was snap, every thing was on 1 pallet nicely wrapped up. I'm going to do another though it will.be a smaller one for a vehicle. It says it can be done by two people in about 5 hours. With the weight of the ribs it took me and 1 other about 20 hours, a little deceiving. Love it though.